Last week my mother sent me a bag full of stuff I had left behind at home and in it I found this. The massive dial of a really, really old wristwatch (given to me by a cousin) and which I wore all throughout college. I loved the watch because a) It had Clark Gable all over it, b) Was different from regular watches, c) And in most cases was a great conversation starter. The strap is all mouldy which I have pulled off and was wondering what I could do with it, considering I don't want it to be lying at the bottom of the bag forever. Any cool ideas? 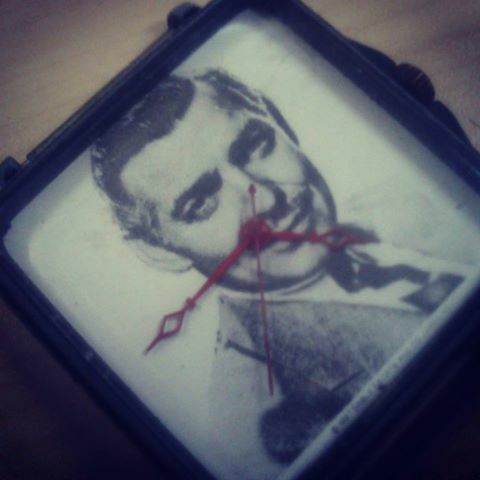 Get the same pic of clark gable(think you should find it in google) blast it to a size of a normal clock. You can get the main of a clock from any small watch store too. Take your piece and and stick if to the best suited place on the clock size image. Pierce a whole in the center and attach the hands. Frame it!!! Voila!! Fix your watch on the top centre of a thick A4 sheet. Beneath it write this story and the watch's history. Get it framed and hang it on your wall. Your watch, and Clark Gable are immortal now!